Here's an overview of fish, from the dangerous Red Bellied Piranha to the docile Red Aphyosemion, that begin with the letter "R."
Rachow's Darter Tetra - Characidium rachovii: This bottom dwelling Tetra likes to be around its own kind. It lives well with fish like Danios that dwell at the tank's mid top but don't keep it with larger fish that are predatory. Rainbow Cichlid - Herotilapia multispinosa: The Rainbow Cichlid is can alter its coloring according to its moods. The background color is a lemon yellow to gold, and it has a horizontal black bar running from behind the eyes to the caudal fin's base. Rainbow Copella - Copella vilmae: Copellas are unique as they lay their eggs on plants out of the water. When a female agrees to spawn, she positions herself next to the male. The partners then leap out of the water together and attach themselves to the underside of a leaf using the suction of their fins. Rainbow Shark - Epalzeorhynchos frenatum: The Rainbow Shark is a good fish for a semi-aggressive aquarium, as long as it's the only shark and its tank mates are of a similar size. Rainbow Tetra - Nematobrycon palmeri: Rainbow Tetras are peaceful but can exhibit territorial behavior with each other. Keep them in groups of at least 10 to reduce aggression between males. Ram Cichlid - Microgeophagus ramirezi: The ram cichlid is a popular fish for a tropical freshwater aquarium. While most don't do well in a community tank, a male and female pair can live together quite nicely. Rathbun's Bloodfin - Aphyocharax rathbuni: Keep the peaceful Rathbun's Bloodfin in a shoal of at least six. However, don't keep it with predatory fish or those with long fins. Red Aphyosemion - Aphyosemion sjoestedti: This is a quiet and shy species and it will be intimated by more by more vigorous fish and out-competed for food. Red Base Tetra - Hemigrammus stictus: This peaceful Tetra that won’t do well with larger or boisterous tank mates. Keep them in a group of at least six, and ideally 10 or more as they prefer their own kind. Red Bellied Piranha - Serrasalmus nattereri: These fish live in a huge school and spend most of their time trolling for prey. 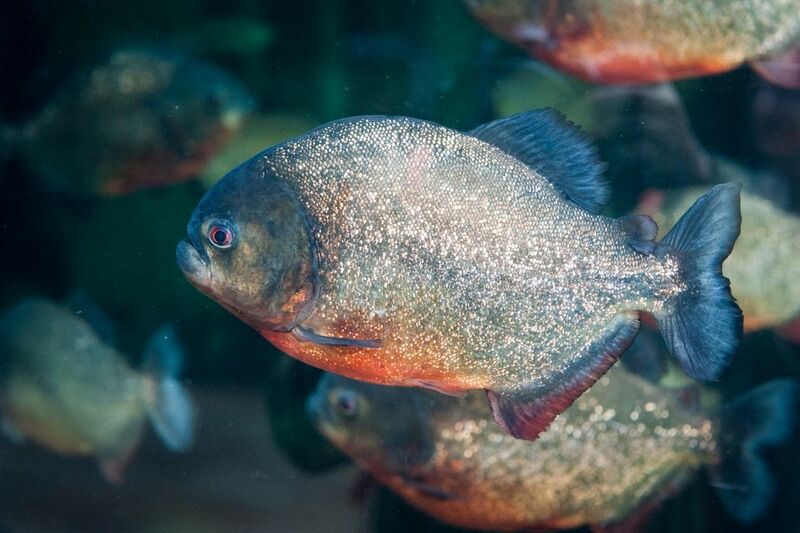 The Red Bellied Piranha is a freshwater predator that is dangerous to both people and animals. Nate Abbott / Getty Images. More Fish Names That Begin With the Letter "R"
Rio Madeira Apistogramma - Apistogramma sp.